Centrally located within the heartland of the United States, Indianapolis — the capital of Indiana — has long been known as the home of the Indianapolis 500, one of the most important race car events in the world. But as other major US sporting events also choose the Circle City for their crowning moments — including the 2012 NCAA men’s basketball Final Four tournament and the 2012 Super Bowl — the city has become more than just a pit stop along the race track, with a burgeoning arts and culinary scene that has revitalized the convention-heavy downtown corridor. A formerly sleepy city that seemed set in its ways, Indianapolis is filled with new life thanks to the efforts of its culinary community. Restaurants from Washington to Michigan Streets in the city’s downtown — once dated in their offerings — have been renewed, both in atmosphere and aliments. Eateries like the historic St. Elmo Steakhouse, a fine dining city classic well-known for its nostril-burning, yet oh-so-satisfying shrimp cocktail made with freshly-grated horseradish, have been joined by newcomers like the swanky, art-filled Capital Grille, a steakhouse located in the Conrad Indianapolis hotel. Building on the success of Pizzology, a popular pizzeria and pub in Carmel, a suburb of Indianapolis, chef and restaurateur Neal Brown opened the Libertine just in time for the Super Bowl extravaganza. 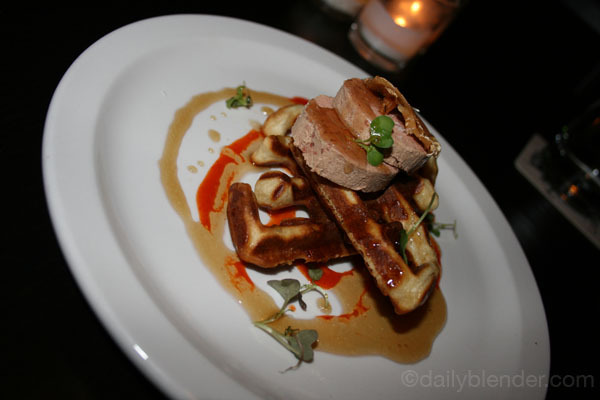 A pioneer in the city’s ambitious culinary scene, the restaurant’s menu features bites like chicken paté and waffles — a hip take on the classic Southern chicken and waffles — alongside Prohibition-era craft cocktails like an Old Fashioned, made with bourbon and bitters, or a French 75, made with gin and champagne.